Before we dive into the best way to clean your bong, we’ll start with what you can use to clean your piece of that icky resin! 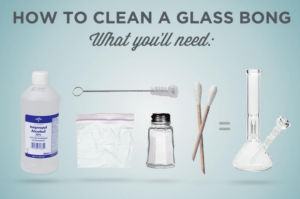 Yes, we’ll cover how to clean your bong in no time! Because salt is coarse, when combined with the alcohol it is abrasive to the resin and bong residue, helping to give you a clean bong even faster. Wire pipe cleaners are perfect for getting the hard to reach spots of your bong clean! This is important for the next steps! Securely covering the openings of your bong helps make the process quick and spill-free. Res Caps are the only bong caps we’ve found that actually works. Empty your bong water and rinse your glass with warm water. Try to remove as much debris as possible. You’d be surprised at how far just hot water can go cleaning your glass pieces. If you’re in a pinch and don’t have alcohol, this will at least help you hold out a little longer until you can get some bong cleaner. Getting resin out of a bong can be tricky, especially if you’ve never done it before. This is where most people have questions on how to clean a bubbler, bong or water pipe. Start by pouring a medium amount of your cleaning solution into the bong followed by a handful of salt. We usually fill the bong up with alcohol slightly less than how much you would fill it up with water to smoke. You can also use a spoon to pour the salt down the chamber of your bong! Cover any openings with appropriately sized material. The goal is to keep the openings sealed and prevent leaking or spilling in the next step. A common solution is using cotton balls to cover the bowl/stem openings and a small hand towel for the main tube of the water pipe. Plastic wrap and a rubber band is also a way to keep the seals tight! After letting the alcohol solution soak, it’s time to shake things up. Firmly grasp the covered openings of your bong and shake the solution inside. The salt will act as a light abrasive to clean through the tough spots of your dirty bong. This is where plastic wrap or cotton balls keeps things clean and spill free! Whatever doesn’t get clean after about a minute or so of shaking with alcohol and salt, use pipe cleaners to get in through the stem of the bong to get the rest of the resin off your glass piece if need be. Empty the dirty solution and rinse with clean water. Rinse your glass water pipe several times to ensure there’s no trace of alcohol or fumes. Then, fill your bong up with fresh water and pack a bowl. Enjoy a crisp, clean smoke sesh! Cleaning your bong, pipes and other pieces is the reality of smoking out of them. If you’re a regular bong smoker, you know the pains of smoking a dirty piece and the effort it takes to clean. Thankfully, after years of practice, we’ve found a handful of ways to keep it cleaner, longer. This strategy requires the most effort. But it is also the most efficient for keeping your bong clean over time. The rules are simple. 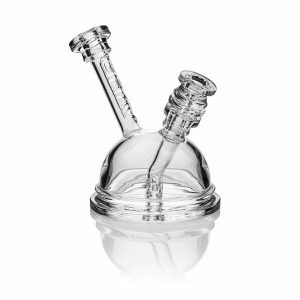 Only fill your bong with water when you need to smoke – and then just empty it out before you put it away. Highly recommended for anyone that only smokes every once-in-awhile. Use external attachments to outsource all the dirty work. Ash catchers are attachments for your bong to help keep things clean. The ash, debris, and resin of each bowl will collect in the ash catcher instead of going directly into your bong. This helps keep your bong clean for longer without that annoying, mucky buildup of resin along the inside of your glass. Add a few drops of fresh lemon juice to your bong water to help keep it clean longer. The active enzymes break down and prevent resin buildups on the inner glass. It also helps kill that horrible “bong water” smell and helps keep things fresh. Just a few drops in the water of your bong will work magic. So go lightly. Too much will start overpowering your smoke sesh. · Use re-freezable ice cubes to preserve the perfect water level. Replace traditional ice cubes with a fun set of re-freezable ice cubes! As a result, don’t worry about the melting race against the clock anymore. Another reason is it can take a while to find the perfect water level for your bong. So when you finally find it, you don’t want to mess it up. This little tip lets you enjoy icy cool hits without melting ice cubes raising your water levels. Remember to use pieces that are small enough they won’t get stuck in your bong! Check out our Glassware here. Don’t miss this chance to be informed about our new products, sales and more.